Transitioning your summer wardrobe into fall can be tough when it's way too hot to wear boots (or even jeans)! Surprisingly, we had this dilemma in Seattle last weekend when it was a rare 90 degrees. The good news is that there is one simple wardrobe staple that is perfect for this awkward time of year! Thank you so much for stopping by Me & Mr. Jones today! I'm getting so excited for New Year's Eve but still haven't decided what to wear. I was thinking about something velvet like this gorgeous LC Lauren Conrad skirt since velvet is such a great alternative to sequins. The silhouette of this skirt is flattering and it also has pockets- winning! I've worn Lauren Conrad's Runway Collection for Kohl's here and here, but this is definitely one of my favorite looks for winter. In addition to sharing this look with you guys today, I also wanted to share some styling tips for wearing sweaters with skirts! 1. Skater Skirts: Front-tuck your sweater like I have in this post or you could also opt for a cropped sweater like this one! 2. Body-Con Skirts: Form-fitting skirts are very versatile and would work with a cropped sweater if the skirt has a high waist. If not, an oversized sweater with the front delicately tucked will look great too! 3. Midi Skirts: These skirts look excellent with a more tailored sweater tucked all the way in like this outfit here. If the skirt is a shiny material like this faux leather one, try a chunky knit that hits right at the waist. It just so happened that my Rocksbox this month came with the perfect pieces to pair with the outfit from today's post too! This amazing Kendra Scott necklace is even more beautiful in person and I've been wearing it all of the time. I'm also so in love with the serpent bangle by Jenny Bird. It's so nice because it's delicate but also adjustable. The most exciting part is that you too can receive a free month of fabulous Rocksbox jewelry! Use the code MEANDMRJONESXOXO and you'll be all set! I've worn my other suede skirt too many times to count, and this cobalt blue one fits into my skirt collection quite nicely! These polka dot tights are always a go-to winter staple of mine and are the perfect pop of print when wearing a solid skirt or dress. 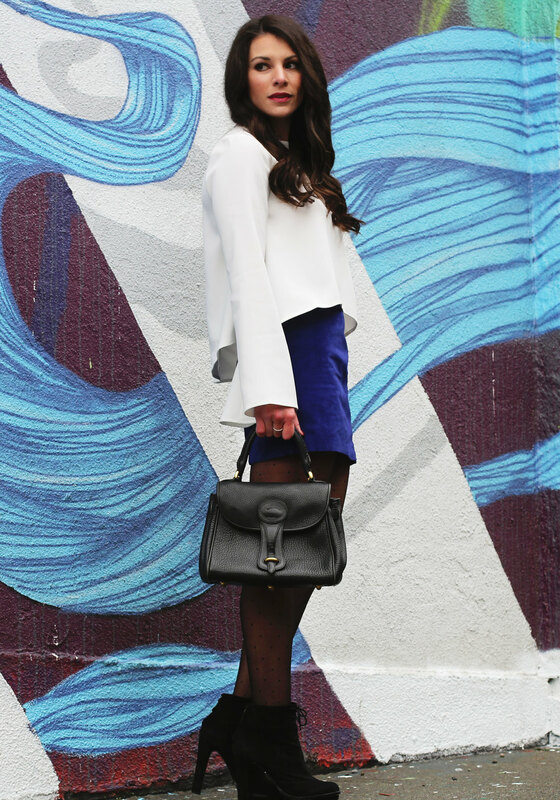 Black tights can get kind of boring during a long winter and these will perk up your wardrobe instantly! The beautiful statement necklace I'm wearing is Jenny Bird from Rocksbox and adds just the right amount of glam to any holiday getup. You can still get one month of Rocksbox FREE with the code "meandmrjonesxoxo"! I absolutely love getting new costume jewelry pieces every month and Rocksbox has so many great pieces perfect for the Holidays and would be a great gift! Have you started your Christmas shopping yet?! 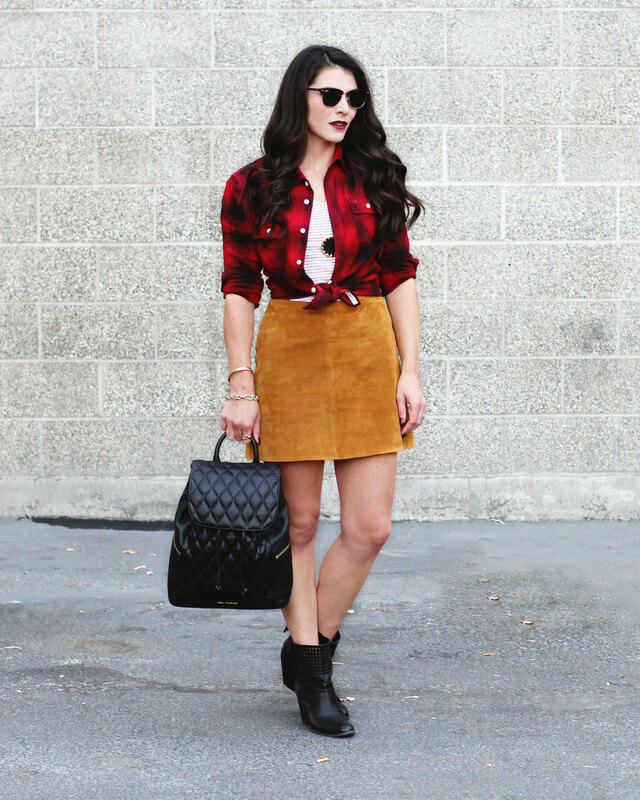 Suede skirts are a key trend piece this season and for good reason! They are so versatile and I've worn mine so many times already. Just like any good basic wardrobe staple, they can easily be dressed up, down, or in-between like this look I wore for a casual date night. I'm also a huge fan of layering flannel shirts in the fall and it's fun to print mix with a stripe tee that has corresponding colors. Since we were going to dinner in a walkable neighborhood, I opted for these perforated boots with a reasonable heel. Luckily, I found a pair almost exactly like mine for only $35 here! Whoohoo! You shouldn't have to sacrifice style while rooting for your team! This JOA Plaid Tie Front Skirt caught my eye because it's perfect for a Sunday brunch. It also could work for a casual Friday at work! The top is from the kids section at Old Navy, but I've linked a similar henley above and below. Have a happy weekend cheering on your favorite team!